Although it's past the time when "best of" lists are released for the previous year, I'm releasing my list of food highlights of 2009 NOW because NOW is the time when I wrote it. This year marked the end of my graduate school career and a move to NE MPLS. Many meals were grabbed in haste between writing for capstone and driving to Wisconsin for class. Many meals were eaten standing over a box with paint on my hands, hair, and/or clothes. The repayment of student loans and an increased mortgage payment made the budget tighter. 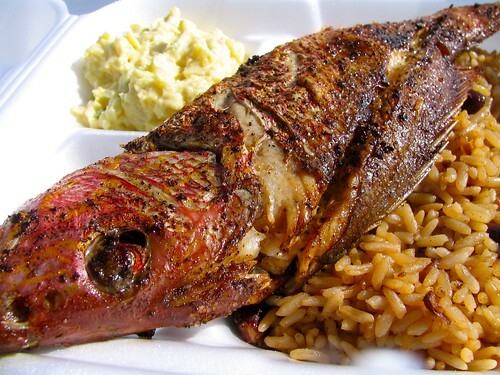 My favorite: while honeymooning last February, we became fond of the red snapper, beans and rice, and potato salad at Off the Reef Conch Shack on Grand Bahama Island (pictured above). I liked ordering food and then combing the beach for seashells while we waited. Last March, we bade farewell to Fugaise with final supper of monkfish with parsnip, portobello mushroom, and bacon; mussels; rabbit meatball with wild mushroom polenta, roasted belgian endive, and apples; and pork loin with potato rosti, braised escarole, and morel cream. Lunch was in order during a Saturday afternoon shopping trip to United Noodles. I had the Taiwanese Soy Bean Paste Noodles. Nothing fancy, just noodles simply topped with highly seasoned crumbled bean curd, sliced cucumber, and bean sprouts. W.A. Frost was offering 1000 points for booking a reservation through Open Table, which was a Friday night bonus. That evening, I enjoyed the Sweet English Pea Risotto served with macadamia nut-yogurt froth, pea tendrils, and black olive oil. Bar Lurcat offered good deals during restaurant week. On a recommendation, I enjoyed a piece of tender and flaky halibut in prosciutto butter with roasted tomatoes and scallions. Ngon Vietnamese Bistro has the passion and commitment for fresh, local ingredients I've come to appreciate in a restaurant. I crave their Phở Bò Viên: this version of their rice noodle soup is made with homemade meatballs using all natural 100% grass fed beef. On a cool afternoon in June, gerg and I decided a big bowl of noodle soup would hit the spot. We headed to Tanpopo Noodle Shop and I had the Nabeyaki Udon Noodles. The noodles float in traditional Japanese soup stock with shrimp tempura, chicken, shiitake mushrooms, fish cake (meh), Japanese omelet, green onion, and wakame. During restaurant week, I had the Puerco Veracruzana at Masa: roasted pork shoulder marinated with lime, garlic and chile ancho; cooked in banana leaf, served with broiled pineapple in adobo sauce and black bean puree. 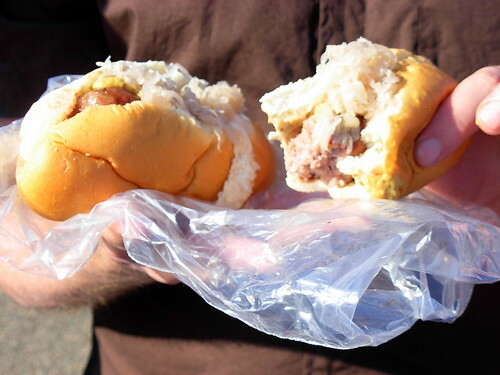 Seward Co-op's cheese stuffed bratwurst made tailgating and backyard cookouts tasty last summer. They rotate about 15 different varieties of sausages at Seward. My job gave me the opportunity to spend some time with Xe Susane Moua of City Backyard Farming. She grows food "locally, organically, and affordably" in Twin Cities' front yards, side yards, backyards, and school yards. At a table beside one of her gardens, she treated me to some fresh post partum chicken soup she had made using a traditional Hmong recipe and herbs she had grown in her garden. I drive past Abu Nader Deli on my commute to work, and I finally decided to stop to pick up a late lunch for gerg and myself. I like their fresh Shwarma. They take those tender, charred pieces of beef and lamb, stuff a lot of them inside a whole piece of their homemade pocket bread, and then top it off with tomato, onion, and a generous helping of cucumber sauce. On a trip to Seattle, I stayed at the Hyatt at Olive 8 and dined at Urbane, where Chef Martin selects the ingredients from local Seattle resources. I enjoyed a plate of tasty cheddar from Beecher's cheese; some lardo, salumi salami, and other meats from Salumi Artesian Cured Meats; chicken liver pate; and caramelized onion grilled flat bread. On my birthday, a couple of pals treated me to a bento box lunch at Obento-ya. The tara black cod bento fillet was naturally seasoned and marinated with an original japanese sake-lees sauce. It was served with steamed white rice, spring greens with house dressing, japanese creamy potato salad, and miso soup. It was my first visit there, but certainly not my last.